February has come and gone; however, with Valentine’s Day, snowstorms and inclement weather, Oscar coverage, and other news/events, you might have missed some of the month’s most breaking VoIP stories. As such, we’ve rounded up the best VoIP stories that might have came in under your radar in February. VoIP experts provide analysis, predications, and insights on all things VoIP related to paint a comprehensive picture of the industry through 2014. As such, experts including Jon Arnold, Ronald Gruia, Dave Michaels, and more, all weigh in on different questions. AudioCodes announced the One Voice Operations Center, which is a suite of management applications for Microsoft Lync and Hosted Services. The center will perform a wide variety of tasks including admin, maintenance, monitoring, assurance and more. As such, the center will also reduce operational expenses, too. With a vibrant job market, forecasted growth, and aggressive recruiting it’s a good time to work in the VoIP industry; however, with so many companies it can be hard to find the right fit. Using Glassdoor, this article provides in depth analysis of the top companies. Communications service provider Vonage announced their results for Q4 and the year, which ended December 31, 2013. The company reported losses in GAAP Net Income, income from operations, net income (excluding adjustments), and revenue. The company also reported growth in business customers, up 40% in Q4 and 38% from the year before. Comcast purchased Time Warner Cable, combining the two biggest cable companies in the US. If the deal is approved, which it’s expected to by the end of the year, Comcast will be the dominant provider of channels in the US, reaching one in three Americans. Blackberry unveiled a slew of upgrades for their Android and iOS app, which are perfect for business users. Updates include VoIP calling, direct Dropbox integration, and new channels designed to offer business users new ways to connect and share interests. Rakuten plummeted 9.5%, which is the biggest drop in over four moths, after announcing its plan to purchase the Viber Internet Messaging and calling service for $900 million. The purchase is designed to bring Rakuten into new markets and generate new income; however, Viber has not done well in predictions and estimates thus far. Gigaclear, a company specializing is establishing fibre networks in rural areas, has been recruiting a number of former BT staff to their advisory board. Here, these experts are helping to build and develop the business model of the company, as well as how to increase the number of communities able to receive broadband speeds. 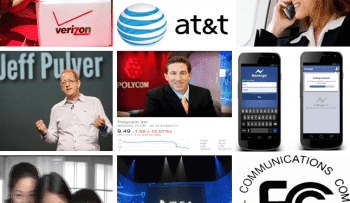 This article is a fun look back at Top Telecom companies’ websites at their beginnings in the 1990s. Looking back, users can see how the limiting the Internet was, and how much it has grown since then. Facebook purchases messenger WhatsApp for $16 billion—$12 billion in shares, $4 billion in cash, and an additional $3 billion in employee retention. Facebook views WhatsApp on track to connect 1 billion people, and plans to keep the app running separately. Insight Research’s market analysis sheds light on voice communications developments, trends, threats, opportunities, and more. In doing so, the study uncovers how important customer retention for providers to retain profits, and how innovation, pricing, services, and options play key roles in retention. New partner programs and enhancements are key in Vonage’s plan to expand from the residential market into the commercial market. After acquiring Vocalocity last year, Vonage has since christened it Vonage Business Solutions and introduced new programs through that channel. Phone Power rebranded itself under the BroadVoice moniker in order to match the company’s broad service offerings, states Chief Executive, Jim Murphy. Offerings include Internet connections in addition to VoIP services. On top of their recent acquisition, WhatsApp plans on introducing voice services to their messaging platform during the second quarter of 2014. The app will continue to use as little bandwidth as possible and retain simplicity. Voice services will be available on Androdi and iOS devices, and then Nokia and Blackberry. Analyst group Frost & Sullivan recent study estimates VoIP & SIP Trunking market earned revenue will grow to $9.35 billion by 2019. This growth is due to these services offering more capabilities that are user aware and value-added than traditional services. Facebook is now able to access and mine WhatsApp users’ personal information—i.e. 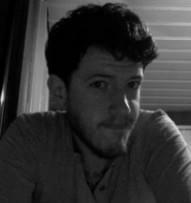 who they message, how often they message, what pictures they share, and the subjects of messages. The company can add this to their arsenal of big data analytics capabilities to recoup their $19 billion purchase. Verizon CEO Lowell McAdams wants “heavy users” to “help contribute to the investment to keep the web healthy.” In other words, users who use more broadband—i.e. streamers, file sharers, etc.—will pay more via a pay per usage model. While Verizon is in favor of this model, there are many who strongly oppose it. Surprisingly, the shortest month of the year was brimming with advances and developments within the VoIP industry. While there were a number of stories throughout the month, not all are all that important big picture wise. 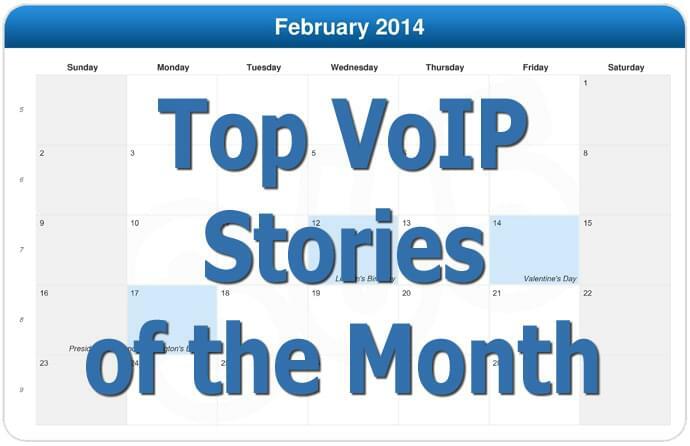 The stories above represent the biggest VoIP happenings throughout February 2014. Feel free to drop us a note and let us know if we excluded any stories.